Join us each month for a hands-on embroidery lesson! Each month we will offer a unique lesson from the BERNINA Creative Studio focusing on machine embroidery. Sign up for the entire year for a discounted price and to receive the complete collection of lessons at end of year! This class will normally meet on the first Thursday of each month. February will be an exception when the meeting will be on Wednesday, February 13. Learn how you can add an embroidery design to an existing in-the-hoop project, thanks to BERNINA's Plus embroidery features. Use un-grouping and embroidery sequence control to quickly insert a design at the right point in your embroidery. Easy, simple, and fast! February - Lettering with Your Machine – Quilt Label No quilt is finished until you label it! Learn to use your machine’s built-in lettering to create an embroidered label with an added embroidery design for a completely customized look! March - Pinpoint Placement Pinpoint Placement is so easy even when your project not hooped perfectly. Learn how to simply select two points to determine the embroidery axis and size, check it to your liking and experience stitching success! April - Free-arm Embroidery Learn to use the BERNINA embroidery machine’s free-arm, which provides you with more space when embroidering projects that are not flat. It makes it easier to create great looking embroidery even on a project with “shape” and can be used with several BERNINA hoop sizes. 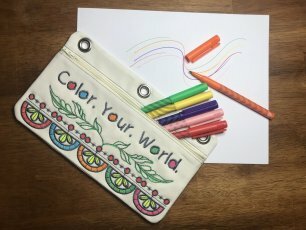 May - Endless Embroidery Learn to use Endless Embroidery to help you line up embroidery designs for the most precise placement for multiple designs such as a borders. It also creates registration marks that are stitched that help take the fear out of re-hooping. Using Endless Embroidery is perfect for embellishing bed linens, table linens and more. June - Hooping Techniques One of the most important steps to beautiful machine embroidery is proper hooping. So what are some hooping techniques and how do I know which will be best for the project at hand? Let’s take a look at the most common methods and some key tips for hooping success. Materials Included: Design files and stabilizer will be provided. Purchasers of the annual program will recieve the collection of design files at December class. Requirements: Bring your embroidery machine in good working order along with your choice of fabric and a selection of threads. Advance registration is essential so that we can contact you each month with suggested supply list.